We offer PP-Syringes Inks. Recommended for Korean Rotary printing system where speed could goes to 15000/hr. Ink therefore successfully used as Syringe printing ink. - Good adhesion to most PP. When used with hardener and treatment agent can also achieve good adhesion to some PE materials. - From high gloss to semi gloss. This high-quality Non-Porous Inks for Batch Coding Marking on PP, HDPE, LDPE, Metal, Glass, Foil, Laminate surfaces. We are amongst the most reputed names in the industry, offering PP Ink. 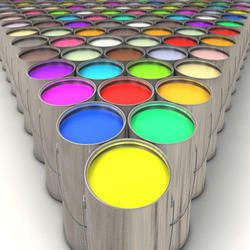 In order to meet excellent quality standards, we are supplying PP Ink. We are one of the foremost firms of Sericol PP Inks. Besides, we present this product at nominal rates to our customers. we have water based flexo ink for pp spunbond Non Woven fabric. We are a top-notch organisation, engaged in providing PP Inks. We are amongst the most reputed names in the industry, offering Maraprop PP Ink. This ink is used for printing on syringe barrels. This is an imported item and we stock it in black and red colors.